The British Broadcasting Corporation (BBC) is the largest broadcasting corporation in the world. Founded in 1922, it produces programs and information services, broadcasting on television, radio and the Internet. The mission of the BBC is to inform, educate, and entertain. Its motto is Nation Shall Speak Peace Unto Nation. Although its funding is primarily through government-set television license fees, the BBC operates independently, based on provision in its charter that it be free from both political and commercial influence. Motivated, at least in its early development, by quality not profit, the BBC became the most respected source of news in the world, praised for its unbiased and balanced reporting. Increasing criticism, based in part on complaints that competition is difficult due to the BBC's income from license fees, and also claims of bias, have led the BBC to develop new methods of generating revenue, the use of digital and interactive media to provide new distribution modalities, as well as a renewed commitment to quality broadcasting. These advances assure the BBC of a significant role in the twenty-first century media arena, a position of great responsibility in an increasingly globalized society. The original British Broadcasting Company was founded in 1922, by various private firms, to broadcast experimental radio services. Its first transmission was on November 14th of that year. The company, with John Reith as general manager, became the British Broadcasting Corporation in 1927 when it was granted a Royal Charter of incorporation and ceased to be privately owned. It started experimental television broadcasting in 1932, becoming a regular service (known as the BBC Television Service) in 1936. Domestic audiences have affectionately referred to the BBC as the Beeb, or as Auntie, the latter originating in the somewhat fuddy duddy Auntie knows best attitude dating back to the early days when John Reith was in charge. Television broadcasting was suspended from September 1, 1939 to June 7, 1946 due to the Second World War. Competition to the BBC was introduced for the first time in 1955, with the commercially and independently operated ITV (Independent Television). The BBC introduced a second TV channel, (BBC 2), in 1964, renaming the existing channel BBC 1. BBC 2 was broadcast in color from July 1, 1967, and was joined by BBC 1 and ITV on November 15, 1969. Since the deregulation of the UK television and radio market in the 1980s, the BBC faced increased competition from the commercial sector (and from the advertiser-funded public service broadcaster Channel 4), especially on satellite television, cable television, and digital television services. The BBC Research Department has played a major part in the development of broadcasting and recording techniques. In the early days it carried out essential research into acoustics, program level measurement, and noise measurement and established standards that rapidly spread, particularly throughout the British Empire. In this respect it filled a role that is now lacking in many areas, since it was motivated by the desire for quality, not profit. Broadcasting House is the headquarters of the BBC in London. Situated in Portland Place, it is normally home to BBC Radio 2, BBC Radio 3, BBC Radio 4, BBC 6 Music and BBC 7. 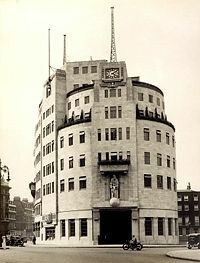 Broadcasting House was officially opened on May 14, 1932. It is difficult to comprehend how miraculous and transformative radio was in the early twentieth century. The architecture of Broadcasting House reflects those intense early attitudes about radio, progress, and science. Walking up Regent Street in London, towards the bend where Regent Street joins Portland Place, directly ahead, the distinctive semi-circular portico and Gothic spire of All Souls Church, erected in 1824, appears. Around the bend, the distinctive semi-circular facade and stylized radio tower of Broadcasting House rise like a temple of progress above the busy street, echoing All Souls and declaring the start of a new enlightened age. At the front of the building are statues of Prospero and Ariel (from Shakespeare's The Tempest). Their choice was fitting since Prospero was a magician, and Ariel a spirit of the air, in which radio waves travel. Broadcasting House was the home of the BBC Radio Theatre, where music and speech programs (typically comedy for BBC Radio 4) were recorded in front of a studio audience. As well as the various BBC buildings in London, there are major BBC production centers located in Cardiff, Belfast, Glasgow, Birmingham, Manchester, Bristol, Southampton, and Newcastle upon Tyne. There are also many smaller local and regional studios scattered throughout the UK, some of which are known locally as "Broadcasting House" in imitation of the BBC's London headquarters. The BBC is a quasi-autonomous public corporation operating as a public service broadcaster, incorporated under a royal charter. The charter is reviewed on a ten-yearly basis, by a board of governors appointed by the government. The BBC is required by its charter to be free from both political and commercial influence, and answers only to its viewers and listeners. Abolition of the BBC Governors, to be replaced by a "BBC Trust"
Reduced emphasis on "ratings for ratings' sake" and copycat programs (such as reality television). The BBC is a nominally autonomous corporation, independent from direct government intervention. It is run by an appointed Board of Governors. General management of the organization is in the hands of a Director-General, appointed by the governors. The BBC has the largest budget of any UK broadcaster; its annual budget in 2005 was approximately £3.8 billion. The principal means of funding the BBC is through television license fees. Such a license is required (Under the 1947 Wireless and Telegraphy Act) to operate a broadcast television receiver within the UK. The cost of a television license (as of 2006 costing around £11 a month) is set by the government and enforced by criminal law, but the revenue is collected privately and does not pass through the state before reaching the BBC, and hence it is inaccurate to refer to the BBC as a "state" broadcaster. Income from commercial enterprises and from overseas sales of its catalogue of programs substantially increased at the beginning of the twenty-first century. £2,940.3m license fees collected from consumers. £624.3m from BBC Commercial Businesses. £247.2m from the World Service, of which £225.1m is from grants (primarily funded by the Foreign and Commonwealth Office), £16.7m from subscriptions, and £5.4m from other sources. £23.5m from other income, such as providing content to overseas broadcasters and concert ticket sales. Among the BBC's many services are domestic radio and television stations. Its wholly owned commercial subsidiaries jointly operate a number of other broadcasting services, namely the UKTV channels, some of the Discovery channels, and several other services available on satellite and cable service in the UK. The BBC also has many non-broadcasting ventures within the United Kingdom, including book and magazine publishing (BBC Books), and multimedia production services (DVDs, CDs, computer games) provided by BBC Multimedia. These are predominantly owned and operated by BBC Worldwide Ltd, profits from which are fed back into the corporation to subsidize program making. The BBC has both satellite and cable broadcasting joint ventures serving the United States, Canada, and other countries. In addition, the BBC operates world broadcasting services (especially radio) in cooperation with, and some funded by, the Foreign and Commonwealth Office. In 2005, the BBC announced that it would substantially reduce its radio broadcasting in Eastern European languages and divert resources instead to a new Arabic language satellite TV broadcasting station (including radio and online content) in the Middle East, to be launched in 2007 . Also run jointly with the Foreign and Commonwealth Office is BBC Monitoring, which monitors radio, television, the press, and the Internet worldwide. Before the introduction of ITV in 1955, and subsequently Independent Radio in 1973, the BBC held a monopoly on broadcasting. More recent deregulation of the British television broadcasting market produced analogue cable television and satellite broadcasting and later digital satellite, digital cable and digital terrestrial television (DTT). Today the BBC broadcasts in almost all media and operates an Internet service, [bbb.co.uk]. BBC News claims to be the largest broadcast news gathering operation in the world, providing services to BBC domestic radio as well as television networks such as BBC News 24, BBC Parliament, and BBC World, as well as BBCi, Ceefax, and BBC News Online. New BBC News services that are also proving popular are mobile services to mobile phones and PDAs. Desktop news alerts, e-mail alerts, and digital TV alerts are also available. BBC News and Current Affairs is a major arm of the BBC, responsible for the corporation's news gathering and production of news programs on BBC television, radio, and online. It is the largest news broadcaster in the world and produces almost 100 hours of output daily. The News department consists of 3,500 staff of which 2,000 are journalists. The annual budget of BBC News is £350 million. BBC News carries out a key objective of the BBC's Royal Charter: to "collect news and information in any part of the world and in any manner that may be thought fit." BBC News is based at Television Centre (TVC), on Wood Lane in London, and operates regional centers across the United Kingdom as well as 44 newsgathering bureaus around the world. Of these bureaus, 41 are based overseas. Political coverage is based at the Millbank Studios in Westminster. Due to the non-central location of TVC, however, in 2008 the News Centre is due to move to BBC Radio's headquarters, BBC Broadcasting House at Portland Place in Central London. Within the United Kingdom, BBC News faces competition from Sky News and ITN (Independent Television News). It is important to note however, that the ITN News Channel (also known as the ITV News Channel) ceased broadcasting in the UK. In 2005, it was announced that the BBC Six O'Clock News was the most popular daily news program, whilst the corporation's 24 hour rolling news channel, BBC News 24, was the most popular 24 hour news channel in Britain . The BBC is one of the most respected news broadcasters, garnering respect in the UK and around the world. It has won praise for its unbiased and balanced reporting. Research has shown that for coverage of major events, such as the Iraq war and September 11 attacks, viewers turned to the BBC. It is, however, not free from controversies and criticisms from some commentators. The BBC is required by its charter to be free from both political and commercial influence, and to answer only to its viewers and listeners. Nevertheless, the BBC's political objectivity is sometimes questioned. For instance, The Daily Telegraph (Aug 3, 2005) carried a letter from the Soviet KGB defector Oleg Gordievsky, referring to it as "The Red Service." Books have been written on the subject, although rarely from people writing neutrally themselves, including anti-BBC works like Truth Betrayed by W. J. West and The Truth Twisters by Richard Deacon. The BBC is regularly accused by the government of the day of bias in favor of the opposition and, by the opposition, of bias in favor of the government. Similarly, during times of war, the BBC is often accused by the UK government, or by strong supporters of British military campaigns, of being overly sympathetic to the view of the enemy. This gave rise in 1991, during the first Gulf War, to the satirical name "Baghdad Broadcasting Corporation." Conversely, some of those who style themselves anti-establishment in the United Kingdom, or who oppose foreign wars have accused the BBC of pro-establishment bias or of refusing to give an outlet to "anti-war" voices. Some have argued that a current of anti-BBC thinking exists in many parts of the political spectrum and that, since the BBC's theoreticalmeans they will broadcast many views and opinions, people will see the bias they wish to see. This argument is buttressed by the fact that the BBC is frequently accused of bias by all opinions in a dispute. Examples of controversies and criticisms over BBC News reporting include coverage of the Iraq War and the Israeli-Palestinian Conflict, as well as criticism over their use of the English language and the views of foreign governments. Three BBC News reports (Andrew Gilligan's on Today, Gavin Hewitt's on The Ten O'Clock News and another on Newsnight) quoted an anonymous source that stated the British government (particularly the Prime Minister's office) had embellished the "September Dossier" with misleading exaggerations of Iraq's weapons of mass destruction capabilities. The government angrily denounced the reports and accused the corporation of poor journalism. Subsequent weeks saw the apparent suicide of the BBC's source, David Kelly, and resignation of BBC Chairman, Gavyn Davies. In 2006, an independent inquiry set up to "assess the impartiality of BBC news and current affairs coverage of the Israeli-Palestinian conflict with particular regard to accuracy, fairness, context, balance and bias" has determined that there is no systematic bias, but that coverage sometimes gives an incomplete picture which may mislead viewers and affect their understanding of the situation., . The commission's report suggested that the BBC's news reporting was not sufficiently covering the suffering of Palestinian civilians, and was too focused on the Israeli perspective of events. Previously, the BBC's news coverage has been accused of "systematic anti-Israel bias" ,. The majority of such accusations come from Zionist or pro-Israeli groups. A particular criticism made of BBC News since the bombings in London on July 7, 2005 is its perceived reluctance to use the word "terrorist" in reporting. For example, Palestinians who bomb civilians in Israel are often referred to as "militants." Alternatively, those responsible for the attacks in London were called "suicide bombers" in some reports. In its defense the BBC says that the word "terrorist" is not banned, but it prefers to use "more precise wording." Some on the right in the U.S., particularly those close to the Bush administration, have accused BBC News of having an anti-American bias. BBC News reporters and broadcasts have recently, and have been in the past, been banned in several countries primarily for reporting which has been unfavorable to the ruling government. For example, its correspondents were banned by the former apartheid régime of South Africa. The BBC has been banned by the administration of Robert Mugabe in Zimbabwe, whose government first sought to censor its broadcast, and later proscribed it as 'a terrorist organization' . Other examples include China , Sri Lanka  and Pakistan. The BBC has five major national stations, BBC Radio 1 ("the best in new music"), BBC Radio 2 (the UK's most listened to radio station, with 13.7 million weekly listeners), BBC Radio 3 (specialist-interest music such as classical, world, arts, drama, and jazz), BBC Radio 4 (current affairs, drama and comedy), and BBC Radio 5 Live, and Radio 5 Live SportXL (24 hour news, sports and talk). There is also a network of local stations (for example BBC Hereford and Worcester, BBC Radio Jersey and BBC London) with a mixture of talk, news, and music in England and the Channel Islands as well as national stations of BBC Radio Wales, BBC Radio Cymru (in Welsh), BBC Radio Scotland, BBC Radio nan Gaidheal (in Scots Gaelic), BBC Radio Ulster, and BBC Radio Foyle. The BBC has been at the forefront of digital radio broadcasting with BBC Five Live Sports Extra (a companion to Five Live for additional events coverage), BBC 1Xtra (for black, urban, and gospel music), BBC 6 Music (alternative genres of music), BBC 7 (comedy, drama, and kids shows), BBC Asian Network (Asian talk, music, and news in many Asian languages), and BBC World Service. For a worldwide audience, the BBC produces the Foreign Office funded BBC World Service, which is broadcast worldwide on shortwave radio, and on DAB Digital Radio in the UK. The World Service can be received in 139 capital cities worldwide and is a major source of news and information programming for over 140 million listeners worldwide. The Service currently broadcasts in 43 languages and dialects (including English), though not all languages are broadcast in all areas. All of the national BBC radio stations, as well as the BBC World Service, are available over the Internet in streaming audio format, and podcasting. BBC One and BBC Two are the BBC's flagship television channels. BBC One is a regionalized TV service which provides opt-outs throughout the day for local news and other local programming. The BBC is also promoting the new channels BBC Three and BBC Four, which are only available via digital television equipment (already in widespread use in the UK, with analog transmission to be phased out from 2008). The BBC also runs BBC News 24, BBC Parliament, and two children's channels, CBBC and CBeebies, also on digital. Since 1975, the BBC has also provided its TV programs to the British Forces Broadcasting Service (BFBS), allowing members of HM Forces serving all over the world to watch and listen to their favorite programs from home on two dedicated TV channels. Beginning in 2006, BBC HD began hi-definition (HDTV) broadcasts. It has been producing programs in the format for many years, planning to produce 100 percent of new programs in HDTV by 2010. BBC Worldwide Limited is the wholly owned commercial subsidiary of the BBC, responsible for the commercial use of BBC programs and other properties, including a number of television stations throughout the world. The cable and satellite stations BBC Prime (in Europe, Africa the Middle East, and Asia), BBC America, BBC Canada (alongside BBC Kids, and BBC Japan broadcast popular BBC programs to people outside the UK, as does UK.TV in Australasia. BBC Worldwide also runs a 24-hour news channel, BBC World and co-runs the UKTV network of stations in the UK, producers of amongst others UKTV Gold. In addition, BBC television news appears nightly on many Public Broadcasting Service stations in the United States. Many BBC programs (especially documentaries) are sold via BBC Worldwide to foreign television stations, and comedy, documentaries, and historical drama productions are popular on the international DVD market. BBC Worldwide also maintains the publishing arm of the BBC. BBC Magazines, formerly known as BBC Publications, publishes the Radio Times and a number of magazines that support BBC programming such as Top Gear, BBC Good Food, The Sky at Night, BBC History, BBC Wildlife and BBC Music. In addition, BBC Worldwide acquired the independent magazine publisher Origin Publishing in 2004. The bbc.co.uk website, formerly BBCi and before that BBC Online, includes a comprehensive, advertisement-free news website and archive. It is the UK's most-visited digital destination with over 3 million web pages. In January 2006, bbc.co.uk was the 11th most popular English Language website in the world. The website allows the BBC to produce sections which complement the various programs on television and radio. The site also allows users to listen to most BBC radio output live and for seven days after broadcast; some TV content is also distributed. A system is under development to deliver both radio and TV content for offline use for up to seven days. BBCi is the brand name for the BBC's interactive digital television services. Unlike Ceefax, BBCi is able to display full-color graphics, photographs, and video, as well as educational programs. BBCi provides viewers with over 120 interactive TV programs every year, as well as the 24/7 service. It also has video weather and news. Despite criticisms from some in politics and business, the BBC remains an important force in British and worldwide media. Continued expansion into other media from television to radio to the Internet is evidence of the BBC's vigor and commitment to promoting quality in broadcasting, as required in its charter. ↑ Press Release 2004 Retrieved July 9, 2008. ↑ Western House - The New Studios. BBC. Retrieved July 9, 2008. ↑ BBC governors set to be scrapped, March 2, 2005, BBC.BBC News. Retrieved July 9, 2008. ↑ Peter Horrocks, "Television News," October 6, 2005  Newswatch. Retrieved July 9, 2008. ↑ impartialityBBC. Retrieved July 9, 2008. ↑ Manchester Demo March 29th. Retrieved July 9, 2008. ↑ Was the BBC really biased against the war? October 9, 2003,  Cardiff. Retrieved July 9, 2008. ↑ Study deals a blow to claims of anti-war bias in BBC news.guardian.uk. Retrieved July 9, 2008. ↑ Impartiality Review Israeli-Palestinian Conflict.BBC governors. Retrieved July 9, 2008. ↑ BBC 'must improve Mid-East view'BBC News. Retrieved July 9, 2008. ↑ BBC's coverage of Israeli-Palestinian conflict 'misleading'.Guardian. Retrieved July 9, 2008. ↑ BBC Newsnight's Insidious Accusationshonestreporting. Retrieved July 9, 2008. ↑ Reporter's tears for Arafat were 'biased'.thescotsman. Retrieved July 9, 2008. ↑ "Editorial Guidelines in Full" more precise wording.BBC. Retrieved July 9, 2008. ↑ Broadcasting of BBC in Zimbabwe stopped. afrol. Retrieved July 9, 2008. ↑ CHINA: Censor blocks sensitive issues in BBC series.asiamedia. Retrieved July 9, 2008. ↑ Sri Lanka 'drops war censorship' October 31, 2007,.BBC News.Retrieved July 9, 2008. ↑ BBC Urdu taken off Pakistan radio BBC News. Retrieved July 9, 2008. ↑ Governors' Review of Services: BBC World Service & Global News.BBC governors. Retrieved July 9, 2008. ↑ Top English Language Sites.alexa. Retrieved July 9, 2008. Wilson, H.H. 1961. Pressure Group. History of the political fight to introduce commercial television into the United Kingdom. Rutgers University Press. This page was last modified on 8 December 2016, at 23:59.